TMZ.com has assembled their list of the 25 Most Desirable Women for 2007. Beyonce is #1. Not a bad choice -- she is quite desirable. Elisha Cuthbert came in at #10. They had Jessica Simpson down at #21, which I think is a little low, but is probably a reflection on her sinking career. Will someone please put Ralph Nader out of his misery already? I watched this guy on CNN yesterday morning refusing to acknowledge his culpability in giving us the George W Bush presidency. He is now saying "it is too early to say" if he will make a another run for the White House in 2008. Look, Nader did some respectable work in the 1950s and 60s. He's not all bad. But he has now run for President in 1996, 2000, and 2004 and he still has not been able to rise above 5% nationally. Nader's presidential runs are not serious. He does it for his ego, and he only runs against Democrats. Nader needs to be put in his place -- a retirement community. Indie darlings Clap Your Hands Say Yeah have announced dates for a Spring tour in support of their second album, Some Loud Thunder. The US portion starts in April on the East Coast. Pitchfork has also posted a free MP3 from the new album. Giuliani is in? He has filed a "statement of candidacy" today with the Federal Election Commission. I still say that he will be drummed out of the running by scandal, but that remains to be seen. How many days do you predict before damaging information on Giuliani is "leaked" to the media by the former Bush hit team now working for John W McCain? Pretty bizarre Superbowl last night. I was okay with Indianapolis winning since I have always kinda liked Tony Dungy. 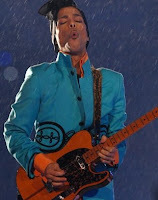 The most impressive part of the night for me was Prince's halftime show. He freakin' wailed on that guitar! Sometimes I forget just how great a guitar player he is because he is better known as a "performer." I was a little confused as to why someone who has been making records for nearly 30 years would take his time in front of a massive audience to play a Foo Fighters song?! I mean, it was cool and all, but Prince has enough of his own material to fill his 10 minutes, right? I'm to the point where I really freakin' hate Ralph Nader. He needs to just be quiet and go away.